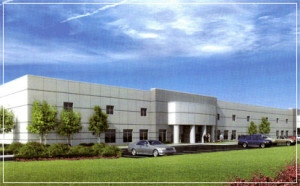 Industrial Partners, LLC is proud to announce that our new speculative building in Montgomery Industrial Park has been selected by Kellogg Sales Company to be home to their new regional distribution center. Kellogg has leased 80,892 square feet of space in our 140,066 square foot facility and the space is being completed based on their very specific requirements. Kellogg is a great addition to Montgomery and will bring great jobs to our community. Nim Frazer, SIOR, represented Industrial Partners, LLC in this lease transaction. David Barber, SIOR, Binswanger, Atlanta, Georgia, and Aaron Weiner, CCIM, Newport Real Estate Services, Inc., Costa Mesa, California, represented Kellogg Sales Company. Industrial Partners, LLC is a leading developer in the state of Alabama, with over 30 years of experience in building, managing and maintaining industrial facilities and parks. For more information on Montgomery Industrial Park, contact us at (334) 244-8650 or email us at info@industrialpartners.com.